During the six-year period between Helplessness Blues and Crack-Up, the world eagerly awaited a follow-up to Fleet Foxes’ 2011 effort, but instead, watched frontman Robin Pecknold retreat from the public eye and drummer Josh Tillman find himself in a flamboyant alter ego. Luckily, Pecknold re-emerged, bringing Fleet Foxes back bigger and better than ever, and showed that the latest from the band was well worth the wait. They brought Crack-Up to life on tour right before its release, also playing a special show for Live from the Artists Den at the Knockdown Center, which was formerly a glass-blowing facility and door factory, in Queens, N.Y. The indie-folk outfit performed old and new favorites, including “Blue Ridge Mountains” from their self-titled record and “Mykonos” from their 2008 EP Sun Giant, as well as “Third Of May/Odaigahara” from their new album. One performance of a Cracked-Up cut was made available exclusively available online, and you can watch it below. In a live rendition of “I Am All That I Need / Arroyo Seco / Thumbprint Scar,” Pecknold’s unmistakable vocals mesmerize, while expansive instrumentals envelope the audience in an almost-orchestral experience. Functioning as three songs in one, the track goes through dynamic shifts, simulating different scenes of a story. 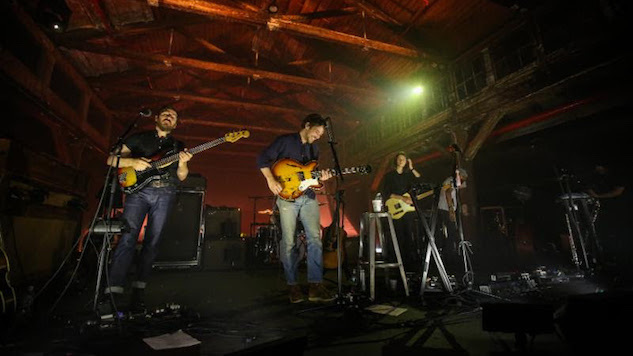 The Fleet Foxes edition of Live from the Artists Den will be broadcasting throughout the country starting in Los Angeles tomorrow, Sept. 30. Reference these select air dates, or check your local listings to find out when you can view the full episode. Watch the web-exclusive clip for “I Am All That I Need / Arroyo Seco / Thumbprint Scar” below, along with a Fleet Foxes performance from the Paste Cloud, and read our review of Crack-Up here.